The Raiders practiced at Nationwide Arena out in Columbus earlier Thursday to get used to their surroundings in a bigger facility than they are accustomed to playing in. Back in studio with more on the matchup between theols raiders. So now that you know that everyone on the raiders team is accounted for - it's time to get down to business with game time on the horizon. The raiders practiced at nationwide out in columbus earlier today to get used to their surroundings in a bigger facility than they are accustomed to playing in. Tennessee may come in with a slightly better advantage playing in a large space - thompson- boling arena in knoxville seats 21,678 fans - while cotterell court in hamilton seats 17-hundred and . 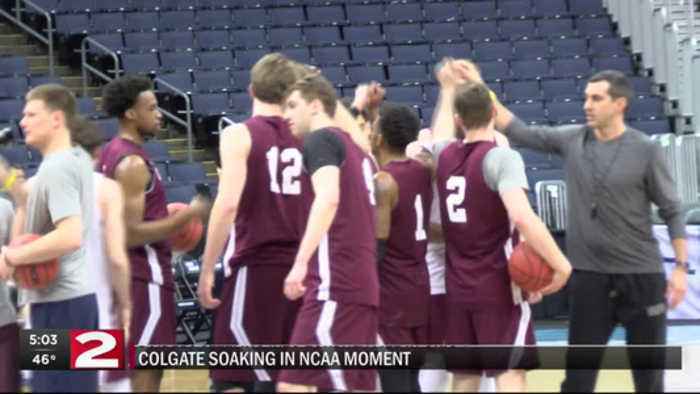 Ile not many people may have picked colgate to beat tennessee in their brackets - the raiders have blocked out all the outside noise and are focused solely on enjoying this experience. Ma lgel: the lasteek plus has been really eiting time for us. I think back to when i was a firstime head coach eight years ago, i didn't necessarily think about winninc players the experiences i had as a ste-athlete.i'm extrely proud of their efforts over the cours season and the offseason.